Wow, where did the financial year go? Wow, where has the financial year gone? It feels like only a couple of months ago that we were setting budgets and completing our tax planning for last financial year, and here we are midway through MasterChef and Orange is the New Black, the 70th Tony Awards are over, and the loved and loathed ‘EOFY’ is only a week away again! I want to ask you a serious question; have you thought about your technology strategy and FY2017 plan? Have you written it down? Have you committed to executing it? Have you told your team about it? In my experience around 10% of businesses will have created a plan, 20% will have thought that they should create a plan but haven’t, and a whopping 70% will have given it absolutely no thought at all. Given most businesses’ investment in technology and their reliance on it, this is alarming! Like any other business planning process, technology planning gives the clarity needed to leverage technology as a business enabler and not let it remain as ‘just another expense’. As the saying goes, “If you fail to plan you plan to fail” and I strongly encourage you to create a technology plan for the FY2017 financial year. We can help if you need help. I trust that FY2016 was successful for you, and from all of the team at Secure Access, I wish you the very best for FY2017. Scroll down to read our July 2016 Technology Update! To take advantage of any of these products or services, please contact your Account Manager today! No really! We are working hard for you to enjoy consistently awesome customer service on each and every ticket, and we want you to let us know how we are doing. Whenever we complete your ticket, the confirmation email will include a simple one-click opportunity for you to rate us as ‘Awesome’, ‘Good’, ‘Average’, or ‘Needs Improvement’. If we aren’t meeting your expectations, we will be back in contact with you inside one business day to find out why and to put it right. We take awesome customer service very seriously! Are you ready for the NBN? After what seems like an eternity, NBN is finally (or very nearly) here for many of us! To take advantage of this new technology we are pleased to announce our SecureNet offering of business grade internet and private network services, and our SecureTel offering of business grade cloud telephone services. We can now connect you directly to the internet via the NBN (or one of many other connection types) and replace your old phone system and phone handsets with our cloud phone system and IP handsets. You will enjoy state of the art telephone system features, access from anywhere, and probably realise fabulous savings on phone call costs! Are you thinking about how you will leverage the NBN in your business? Have you moved to Windows 10? Windows 10 has now been available for close to 12 months and is proving to be a cost effective way to improve the performance, security and functionality of existing computers. Did you know that the Windows 10 upgrade licence is still free (for now…)? Microsoft have confirmed that the free upgrade offer expires on 29 July 2016 and will then be US $119.00 (Australian pricing TBC). While this is only around seven weeks away; we are ready to help you take advantage of this offer right now. Our cost effective ‘sandbox’ approach first tests Windows 10 in a controlled environment on one of your computers, and only when this test is successful do we upgrade the rest of your machines. This ensures that we control any problems that might occur and additionally prevent you needing to download the Windows 10 image multiple times. We recommend that you take advantage of the free Windows 10 upgrade while you can! Are you getting too much SPAM in your diet? Of course I’m not talking about the dubiously delicious meat-in-a-can wonder but about the dozens (maybe hundreds!) of unsolicited emails that fill up our mailboxes each and every day, wasting our time and affecting our productivity! Did you know that SPAM accounts for 14.5 billion messages globally per day? In other words, spam makes up 45% of all email! The United States is the number one generator of spam email, with North Korea a close second. If you are fed up with SPAM and other email-borne threats, our Manage Protect Version 2 email and web filtering solutions might be the answer you are looking for. Are you already using Manage Protect Version 1? Manage Protect Version 2 brings even better filtering and more advanced control. Let us migrate you to Version 2 for only $99 plus GST. Is file sharing driving you crazy? AKA, do you really still need a file server? We recently launched SecureShare, our business-class file sync and share solution. 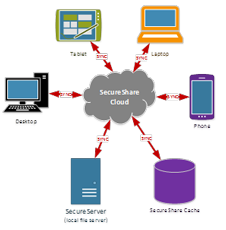 SecureShare provides secured cloud storage and anywhere access for your files and is hosted right here in Queensland. The benefits of secured cloud file storage can be extensive, but consumer-grade services such as Dropbox, Microsoft OneDrive and Google Drive are not appropriate for the workplace. 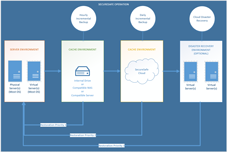 We believe that it is critical for businesses to adopt a business-grade file sync solution that is both easy to use and secure when they migrate their data to the cloud. Are you ready to replace your file server with SecureShare? Are you confident in your Disaster Recovery capability? We have recently revamped our backup and disaster recovery offering and rebranded it as SecureSafe. SecureSafe is a business class offsite server backup, replication and now disaster recovery solution. SecureSafe offers several levels of data protection; from simple external hard drives to replication and storage of your backups in our SecureSafe cloud and even DRaaS (Disaster Recovery as a Service) where you can run your entire environment in our cloud in the case of a disaster. A new finacial year is the perfect time to tick Disaster Recovery off your list!